The XCubeSAN series is virtualization-aware and is highly integrated with leading hypervisor platforms. It is certified by the latest VMware vSphere with VAAI support, Windows Server 2016/2012 R2 with Windows ODX support, and the latest Citrix XenServer. 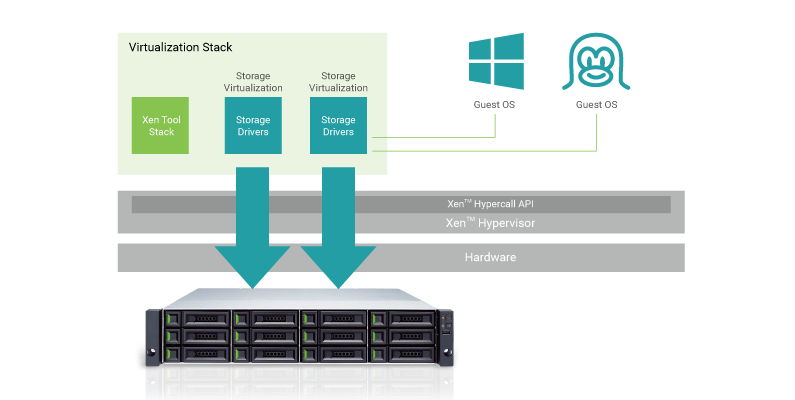 All of these features make the XCubeSAN series an ideal primary storage system for virtualized datacenters to help provision, migrate, and manage VM storage faster and more efficiently, allowing hypervisors to provision data intelligently and run even more VMs with a lower total cost of ownership. SANOS 4.0 supports VMware VAAI functionality. VAAI is a set of APIs that allow ESXi hosts to offload specific virtual machine and storage management tasks to the SAN. 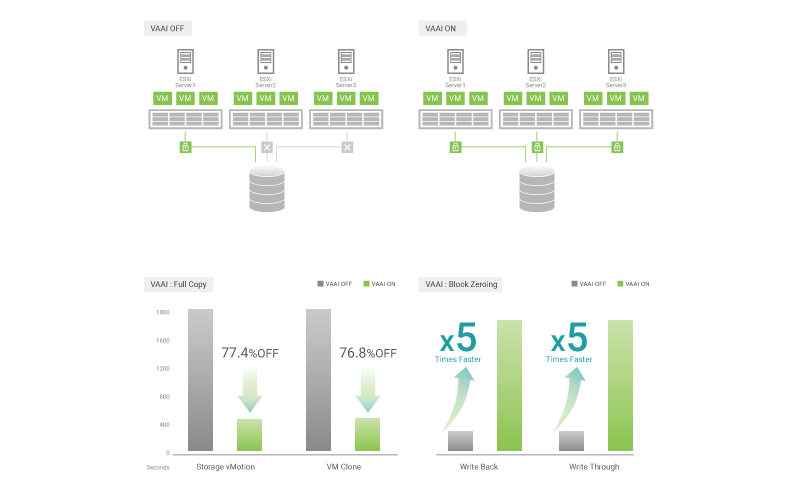 With the support of SANOS 4.0 VAAI, it can offload the ESXi system overheads and as a result the ESXi system can reduce the usage of its CPU, memory, and storage fabric bandwidth. VAAI for iSCSI and FC supports Hardware Assisted Locking, Block Zero, Full Copy, and Thin Provisioning with space reclaim. Therefore, the XCubeSAN series can greatly enhance the performance of operations in a virtualized environment. With ODX (Offloaded Data Transfer) support in SANOS 4.0, the XCubeSAN series becomes a high performance iSCSI storage solution in Windows Server 2016/2012 R2 and Hyper-V virtualized environments. It highly reduces the loading of Windows host servers and improves the performance of copy and move operations. Citrix XenServer is an enterprise-class, cloud-proven, virtualization platform that delivers all of the critical features needed for any server and datacenter virtualization implementation. SANOS 4.0 is compatible with XenServer 6.x.